People who give to charitable causes are happier than those who don’t, regardless of their gender and marital status, and the more they give, the happier they are, a new study finds. The Women’s Philanthropy Institute (WPI), a leader in philanthropy research about the effects of gender on charitable giving, released today the findings of its annual study, Women Give 2017. The study investigated the connection between life satisfaction and charitable giving as part of WPI’s ongoing work to understand differences in how men and women give. Findings from the study, which is funded by a grant from the Bill & Melinda Gates Foundation, have implications for donors and fundraisers alike. Men and women experience the increase in happiness differently, the study found: men receive a greater boost when they become donors, while women see a greater jump in happiness when they give more of their income. In households where women drive or participate equally in charitable decisions, the entire family is happier. • Giving makes people happy. The study found that giving to charitable organizations is positively related to life satisfaction. The more a household gives as a percentage of income, the higher the household’s life satisfaction. • Giving makes all people happy. Across marital status (single women, single men, and married couples), giving to charitable organizations is positively related to a household’s life satisfaction. • When women drive or share in charitable decisions, more giving means higher satisfaction. For households where either the wife makes charitable decisions or spouses make charitable decisions jointly, life satisfaction increases with the percentage of household income given to charity. • This impact is greater in middle- and lower-income households. For households where charitable decisions are driven by women and more than two percent of their incomes are given to charity, households making less than $100,000 per year experience more of a boost in life satisfaction from giving than those making $100,000 or more. • Changes in giving habits affect men and women in different ways. For single men, becoming a donor increases life satisfaction. For single and married women, life satisfaction increases when they increase their giving. Women Give 2017 is an important achievement in the ongoing effort by WPI to understand differences in the ways men and women give. These findings provide strong evidence about not only the link between happiness and giving, but also between happiness and the role of women in their families’ financial decisions. Women Give 2017 was released at a national launch event in Charlotte, N.C. The study used data from the Indiana University Lilly Family School of Philanthropy’s Philanthropy Panel Study (PPS), the longest running survey of philanthropy in the United States, to compare the same households across a number of years. Because this is the first time the PPS data was used in this way, Women Give 2017 is able to offer new insights on how life satisfaction is shaped by household characteristics - such as composition, income, gender roles within the family, and how decisions around charitable giving are made. 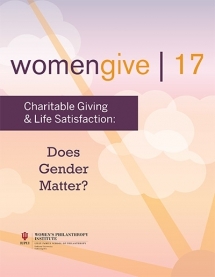 Women Give 2017 is the eighth in a series of signature research reports conducted at the Women’s Philanthropy Institute that focus on gender differences in giving to charitable organizations. Previous reports have examined gender differences in charitable giving across household structure, income levels, marital status, age/generation, and types of charitable organizations receiving these gifts. The Women Give studies have also assessed whether the gender differences observed in adult charitable giving begin to emerge at younger ages and how sons and daughters affect parents’ charitable giving. Women Give 2016 investigated how charitable giving has changed across generations. These reports increase our understanding about how gender influences philanthropy. The Women’s Philanthropy Institute (WPI) is part of the Indiana University Lilly Family School of Philanthropy. WPI increases understanding of women’s philanthropy through rigorous research and education, interpreting and sharing these insights broadly to improve philanthropy. By addressing significant and groundbreaking research questions and translating that research into increased understanding and improvements in practice, WPI helps to leverage new and expanded resources for the common good. Follow us on Twitter @WPIinsights and “Like” us on Facebook. The Lilly Family School of Philanthropy at IUPUI is dedicated to improving philanthropy to improve the world by training and empowering students and professionals to be innovators and leaders who create positive and lasting change. The school offers a comprehensive approach to philanthropy through its academic, research and international programs and through The Fund Raising School, Lake Institute on Faith & Giving and the Women’s Philanthropy Institute. Follow us on Twitter @IUPhilanthropy or “Like” us on Facebook.